Steph and I have been buying (and receiving generous gifts of) baby clothing lately, preparing for the imminent September arrival of our own progeny. As we were sorting the clothing into size bins (which, for the first year, goes in groups of three-month chunks! Interesting.) I came upon a tiny shirt with the tag you see here: McBaby. Don’t misunderstand me, it’s a fine shirt. My son will wear it, and I’m sure it’ll serve its purpose well. But the brand begs a question. I’m trying to put the ideas of fast food and baby clothing together. I understand that McDonald’s occasionally strays off the path of fast food to invest in more noble pursuits, but that doesn’t logically include the fashion industry. This clothing is a for-profit deal. You can’t argue that they’re doing it to expose babies to the McDonald’s brand and logo as early as possible, because the logo is on a tag inside the shirt, behind the baby’s head. Perhaps this is for poltergeist babies? Either way, it’s not exactly eye-catching for a kid who’s already busy contemplating the ceiling fan, and wondering what his hands are. Is it branding for mind share of the parents, then? Or whoever dresses the kid? Perhaps, but again, why not just be direct and advertise your food if you’re a restaurant? Why get into an entirely new business model, new outlets, new partners, new strategies, just for one more logo that only new parents will see, and only occasionally at that? Their brand isn’t that saturated, is it? It can’t be the cool factor. McDonald’s restaurants aren’t nearly as rare as Hard Rock, for instance, so the shirt doesn’t have that “traveller” appeal. I think everyone assumes I’ve been at least 2 miles from home. Nothing to brag about, you know? McDonald’s brand by itself isn’t really so “cool” as it is “fat and lazy”, so I doubt they’re just trying to do this on brand strength alone. I’m absolutely perplexed. Help me out here. Why was McBaby a good idea? How could a company with this much experience in brand recognition throw effort away like that? On a totally different front, let me give you a word of advice on the 3-month spread in clothes: It totally depends on the brand. As a 6 month old Lexi was wearing “newborn” clothes, 3 month clothes, 6 month clothes, 9 month clothes and 12 month clothes. As a 16 month old (right now) she’s wearing everything from 9-12 months to 24 months (and even some 2T stuff). There’s very little standardization in the sizing. You just have to try stuff on and see what fits. I say this because the temptation is to not pull out the 6 month bin until your kid is actually 6 months old (or maybe at 5 months), but you’ll find your kid could out grow stuff before they even have a chance to wear it. Seasonal stuff is another problem, though I’m not sure if that will be an issue for you guys. We were plagued with summer clothes that only fit in winter and winter clothes that would have fit swell in July. My other word of advice is not to buy for the coming season. Sure, the 18-month jumper thing seems great for summer, when Lexi will be 18 months old. Except it’s already getting tight and probably won’t make it to July. By for the current season only (again, may not be a problem for you California types). Ah, California and it’s lack of seasons. Perhaps McDonalds is alluding to the cycle of biomaterial and that someday that McBaby’s Mcmake-up might end up filling a Big Mac? Thus, the McBaby! This bothers me a little. I can’t say I have anything against McDonald’s. I have finally learned to say no to their addictive foods. This reminds me of another company…Philip-Morris, the cigarette company. They have their hands in all sorts of markets. Do a search and it may shock you as a consumer, especially if your a consumer that has reasons not to buy their products (http://www.stanford.edu/group/SICD/PhilipMorris/pmorris.html). Makes you wonder if McDonald’s is preparing for something similiar to what the tobacco industry has gone through over the last 10-15 years. But *where* does Mc Baby clothing come from? 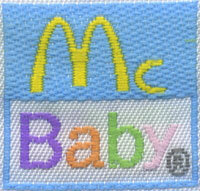 I also recieved many McBaby pieces as hand me downs, but yet to see them in a retail location. Briefly I wondered if they came in happy meals :). But wierdness aside, I do like the clothes.